The Australian Child Dental Benefit scheme is funded by Medicare and is available to eligible families. The system provides $1000 towards the child’s dental treatment over a period of 2 years. It allows for examination, preventative procedures and early intervention treatment to be given to catch and treat any problems before they become a danger to the child’s health. Research has proven that children who regularly visit the dentist continue into adulthood with far better dental health than those who do not. This scheme gives each eligible child the best start in life for dental health. The scheme also will cover costs associated with dental emergencies and pain relief. These days, no child should have to expect to suffer continued dental pain. For more information or to check your child’s eligibility just call ToothKind or email us and we’ll be happy to help you. Some of your friends or family may be not aware of this opportunity to help their kids achieve optimum dental health. Like us on Facebook to let them know! Take your child to the dentist for their first check-up before they are two years old, and then at least once a year every year after that. If your child damages their teeth in any way, contact your dentist immediately. 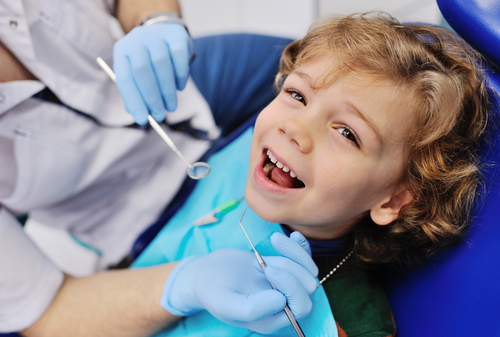 Your dentist will be the best source of advice regarding your child’s oral health care. They may advise more frequent visits or other preventative measures if they notice that your child is at higher risk of developing tooth decay. The good news is that early diagnosis of tooth decay means that treatment can be very conservative and least traumatic for your child. Fluoride is important for developing strong teeth, however it is recommended that you do not use toothpaste containing fluoride for children younger than eighteen months. Overexposure to fluoride can damage developing teeth. By laying your child’s head in your lap, similar to being in a dentist chair, you can have a really good look at their teeth while you brush and floss them. As they get older, it is good for them to get into the habit of flossing, so allow them to floss their own teeth around the age of six. Make flossing and brushing as fun as possible to encourage your child to do it! You should gently wipe your baby’s gums daily with a wet cloth. When their teeth do appear, you can brush them with specially designed baby-friendly brushes, which have small heads, rounded bristles, and will be kind on teeth and gums. Use plain water once a day, not toothpaste. For children between eighteen months and two years of age you can begin to use a pea-sized amount of toothpaste containing low amounts of fluoride, and make sure they learn to spit it out after brushing. For children between two and eight years, you can use smears of regular toothpaste or a milk teeth toothpaste, if they still have trouble spitting out the excess. Supervise while they brush their own teeth first. Up to the age of six, children do not usually have the dexterity required to brush their own teeth well, so help them with the task once they have had a chance to practice on their own. They should be brushing twice a day for at least two minutes each time, usually after morning/evening meals. Don’t forget to replace your child’s toothbrush every three to four months, or when the bristles begin fraying, and do not share toothbrushes between children or yourself. If you’d like to know more, please contact ToothKind.